3…Bb4 Kramnik employs the Nimzo-Indian again. 4. Qc2 Anand chooses the most popular reply. 9. h3 Here we go again. Another novelty from Anand. This seemingly innocent pawn move is the predecessor for a pawn thrust to g4. 10. g4 Anand takes the risky route by starting a kingside attack with the intention of castling the long way. 11. Rc1 Anand plays the best move and threatens playing a3. 11…Bb7 Kramnik avoids Anand’s double discovered threats. 17…Ne7 Kramnik moves his knight so that it will not be pinned. 18. Bb4 Anand directs his bishop stop Kramnik from playing c5. 18…c5 Kramnik decides to play aggressively and push the pawn anyway. 20. Ne5 Anand is showing his world champion form. 21…bxc5 Kramnik not so much(see previous note.) This is an unfortunate mistake by the Russian. Better was Nc6 22.Nxc6 Rxc6 23.Rg3 Rdc8 24.Rd3 Nd5. 22. Rxc5 Anand punishes inaccuracy by profiting a pawn. 24. Nd3 Obviously Anand is not going to play 24.Bxe7 Rc1 mate! 25…Rc2 A strong move but if Anand can activate his rook he will win. 26. Bc1 Anand plans on moving his king to d1. 29. Ke1. This move is very hard to understand. Possible improvements are the natural 29.Rg1 and 29.e3 Nc4 30.Re2 Rd8. 30…e5 Kramnik missed the strategic 30…a4. Unfortunately he spots this move at the wrong time. 33…a4 This is a terrible mistake that Anand quickly punishes. Better would have been 33…Re8. 35. Rg4 Anand plays the second best move. The strongest continuation was 35.e4 Re8 36.Kf1 Nxe4 37.Bh6. 41. fxg7 Anand would have had an easier time if he had played 41.Rxg7+ Ke6 42.f7. However, all roads lead to Rome for Anand. 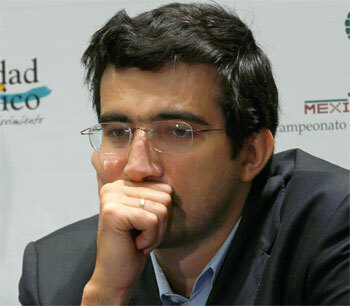 Kramnik has, for all intensive purposes, lost this match. Perhaps, only now can he start playing great chess as Spassky did against Fischer once the pressure had been lifted from the Russian’s shoulders. This entry was posted on October 22, 2008 at 5:20 am and is filed under 2008 world chess championship, Anand vs. Kramnik, World Chess News. You can follow any responses to this entry through the RSS 2.0 feed. You can leave a response, or trackback from your own site. You can download the pgn on these games at chessbase.com. I have been replaying them on my computer and am rather astounded at the dominance of Anand, especially considering Kramnik took the crown away from the great Kasparov just a few years ago. I think Anand is playing openings where Kramnik thought he was strong and so did not prepare as fully as perhaps he should have. Anand is coming up with a new variation almost every day. It is quite impressive.